Over the decades, modern improvements have helped to create beneficial outcomes for homes and businesses alike. Modern science has paved the way for improved building and maintenance techniques, allowing contractors across multiple industries to provide a better outcome for their clients. If you are in need of professional drywall installation for your new structure or for an addition, it’s important to find a company that holds the equipment and expertise needed to create amazing solutions for your needs. One area of focus that can make or break your project is the building envelope. Today, we’ll begin to highlight what this section of your building is, and how vital it is to include the proper elements to create a comprehensively insulated and protected building. If you’re in need of drywall contractors in Chicago, AZ Drywall Finishing is here to offer friendly service and honest results. Since 1999, our commercial drywall company has worked to create the most efficient and accurate services in Illinois, delivering cost-effective results to meet your goals and your budget. We’re dedicated to quality, and our stringent hiring and training program ensures that you are receiving the same level of excellence no matter who is on your site. Contact us today to learn more about our drywall services! Simply put, the building envelope is the physical barrier that separates the inside of your home from the outside world. Generally, this crucial point in the house consists of doors, walls, floors, roofs, and any other openings, such as windows. 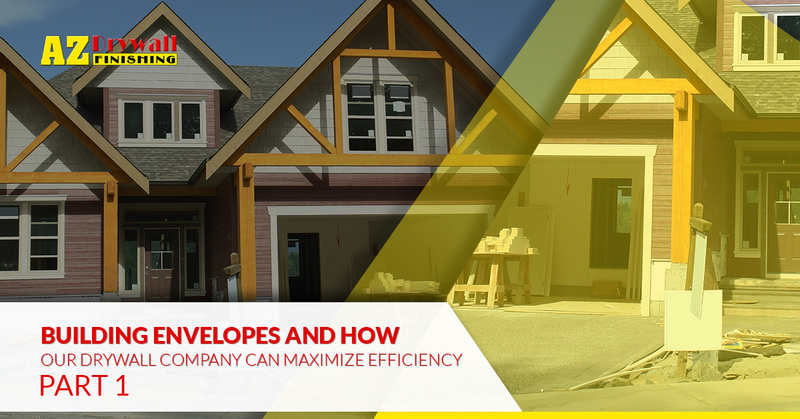 The design and structure of your building envelope will depend heavily on your current climate, as different methods provide different results across our country. Areas that experience periods of freezing cold and hot heat between the two extreme seasons often exhibit elements, such as extra insulation for the winter and ample window openings for a cool breeze in the hotter months. Modern technology has placed an emphasis on the value of proper building design, as your structure can be built to properly impede the flow of heat, making your building more comfortable all year round. Now that you know what this term entails, we can begin to look deeper into the components of your building envelope. Moisture membranes. One effective way to mitigate water dangers is to install a waterproofing membrane that acts as a cover over your foundation walls. This product, when installed properly, can provide long-term protection for the lowest level of your business. Sealants. Drafts are a common result from gaps and holes in your building’s exterior. Elements, such as caulking and weatherstripping, can prove very helpful in keeping the outside elements where they belong. You can reinforce your doors with stripping to add increased protection from drafts. Spray foam. This aerosol can be the perfect product for covering large gaps and sealing out the outside temperatures. This product can act as a heat barrier and provide considerable improvements to the insulatory characteristics of your basement area. Sheet foam. The freeze and thaw cycle that occurs annually can create serious concerns in regards to your foundation. If frost is a concern, you can insulate your floors with foam sheets for added protection. The design of your building envelope can help to make or break the quality of your structure once construction is complete. Next time, we’ll continue this subject by highlighting a few more elements involved with your building envelope. It’s important to hire professional metal stud framing and drywall installation services to ensure that you are receiving the most benefits through the life of your building. AZ Drywall Finishing is here to help with proven services and amazing outcomes, delivering quality and integrity on every site we work on. Our drywall contractors in Chicago are here and ready to provide quality results from start to finish. If you are looking for a professional drywall company for your upcoming project, be sure to contact us today for your estimate!